ALPO monographs are available online ONLY as a pdf files. NONE are available any longer in hard copy format. There is NO CHARGE for any of the ALPO monographs. Note that ALL of these pdf files require the free utility Adobe Reader available at http://adobe.com or click the "Adobe Reader" button at left. Left-click on the file name below the image to simply open the file and read it online. Right-click on the file name, then save the file directly to the folder of your choice on your own terminal. In both cases, the documents will open in Adobe Reader on your terminal. Monograph Number 1. 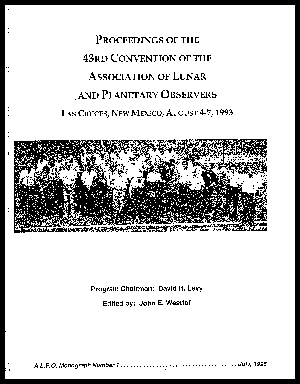 "Proceedings of the 43rd Convention of the Association of Lunar & Planetary Observers. Las Cruces, New Mexico, August 4-7, 1993." 77 pages. File size approx. 5.2 megabytes. Monograph Number 2. 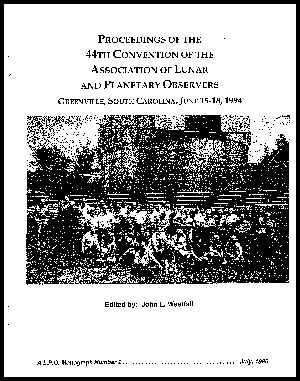 "Proceedings of the 44th Convention of the Association of Lunar & Planetary Observers. Greenville, South Carolina, June 15-18, 1994." 52 pages. File size approx. 6.0 megabytes. Monograph Number 3. "H.P. Wilkins 300-inch Moon Map." 3rd Edition (1951), reduced to 50 inches diameter; 25 sections, 4 special charts; also 14 selected areas at 219 inches to the lunar diameter. If printed out at 100-percent scale, the main map will be at a scale of 35.7 inches to the Moon’s diameter (1:3,832,000), while the scale of the 14 regional charts will be at 156 inches to the lunar diameter (1:875,000). Monograph Number 4. 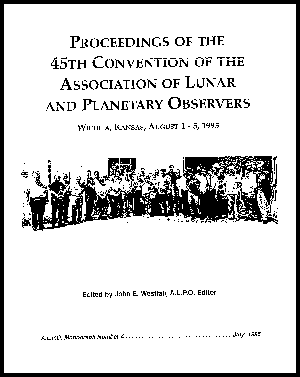 "Proceedings of the 45th Convention of the Association of Lunar & Planetary Observers. Wichita, Kansas, August 1-5, 1995." 127 pages. File size approx. 5.8 megabytes. Monograph Number 5. "Astronomical and Physical Observations of the Axis of Rotation and the Topography of the Planet Mars. First Memoir; 1877-1878" by Giovanni Virginio Schiaparelli, translated by William Sheehan. 59 pages. File size approx. 6.0 megabytes. Monograph Number 6. 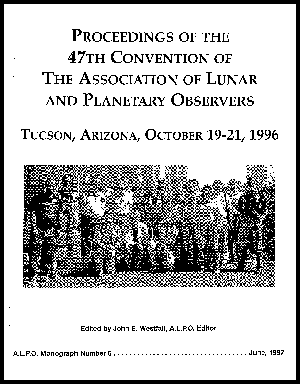 "Proceedings of the 47th Convention of the Association of Lunar & Planetary Observers, Tucson, Arizona, October 19-21, 1996." 20 pages. File size approx. 2.6 megabytes. Monograph Number 7. 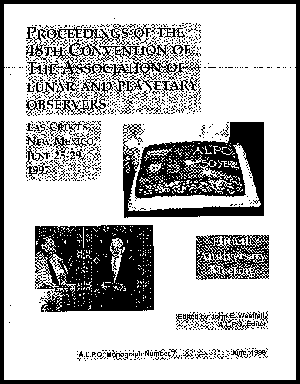 "Proceedings of the 48th Convention of the Association of Lunar & Planetary Observers. Las Cruces, New Mexico, June 25-29, 1997." 76 pages. File size approx. 10.6 megabytes. Monograph Number 8. 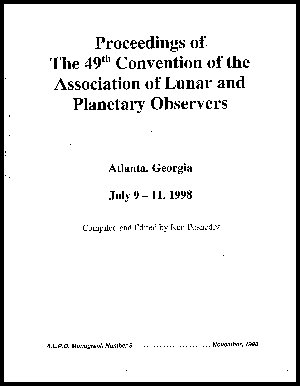 "Proceedings of the 49th Convention of the Association of Lunar & Planetary Observers, Atlanta, Georgia, July 9-11,1998." 122 pages. File size approx. 7.4 megabytes. Monograph Number 9. 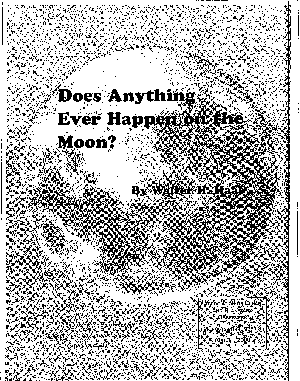 "Does Anything Ever Happen on the Moon?" by Walter H. Haas. Reprint of 1942 article. 54 pages. File size approx. 6.5 megabytes. Monograph Number 10. 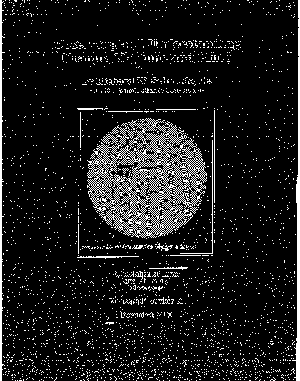 "Observing and Understanding Uranus, Neptune and Pluto" by Richard W. Schmude, Jr. 31 pages. File size approx. 2.6 megabytes. Monograph Number 11. 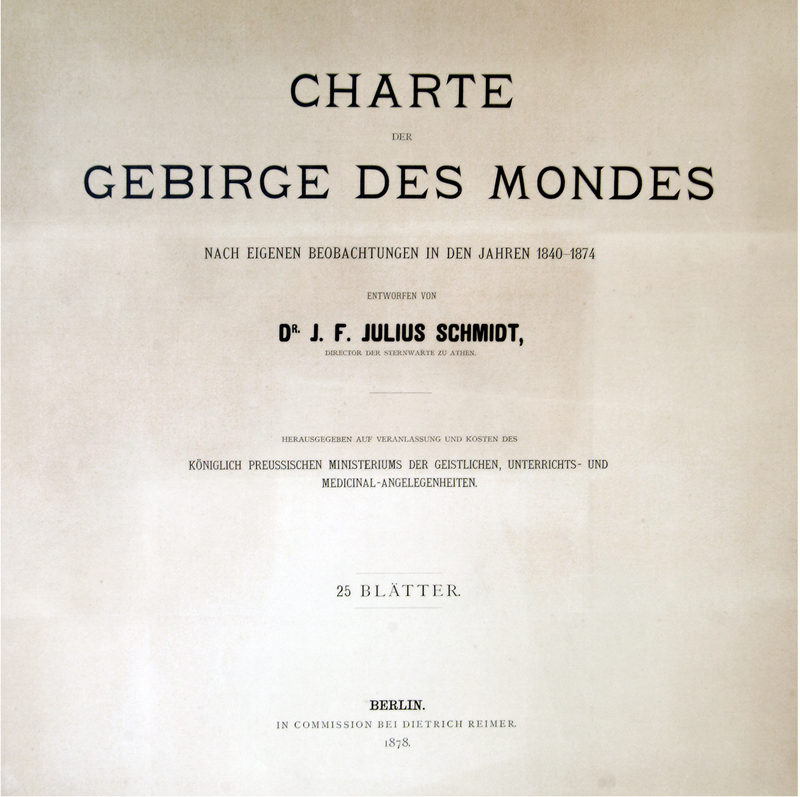 "The Charte des Gebirge des Mondes" (Chart of the Mountains of the Moon) by J. F. Julius Schmidt, this monograph edited by John Westfall. 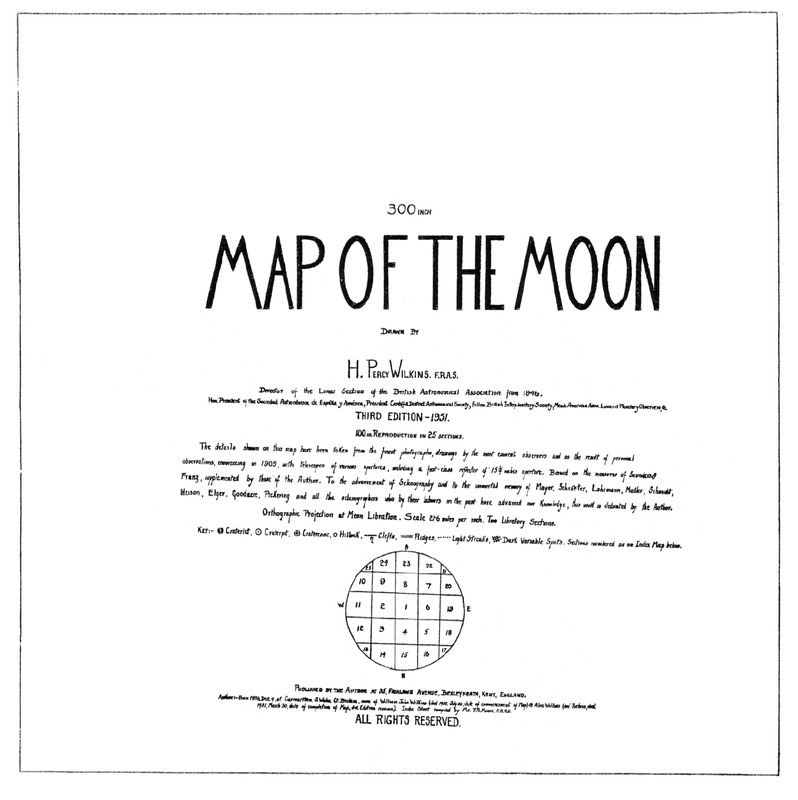 Published in 1878, it was the most detailed lunar map of its time. It represents a continuation of the German school of lunar mapping, following the charts of Lohrmann (1824, 1878) and of Beer and Mädler (1834-36). This monograph includes nine files, including an accompanying guidebook in German. 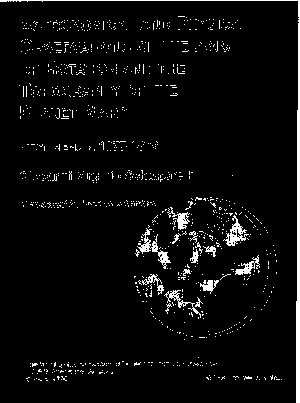 NOTE: The file names designate the various maps included within the files; thus Schmidt0001.pdf includes section 1, Schmidt 0204.pdf includes sections 2 through 4, etc.